I’m not entirely sure how to approach What We Do in the Shadows in that I’m not sure that there is a great deal to say about it. I realize this sounds initially like a bad thing, like this is a dull exercise in comedy that has misfired but the exact opposite is true. What We Do in the Shadows is just about pitch perfect. It’s funny throughout most of its running time and maintains a separation between the audience knowing it’s funny and the film itself knowing it’s funny. What We Do in the Shadows is set up as a documentary. A small film crew has managed to make contact with a group of four vampires who live in Wellington, New Zealand and gotten them to agree to being filmed. The premise itself is ridiculous, of course, but it works really well for the film as it is presented. What makes it work, though, is that the actors play it completely straight. They’re vampires and possessed of incredible powers. They’ve been around for hundreds of years. And they’re really socially inept and not at all sure of how the modern world works. And that is the premise. We have a group of socially inept vampires who can barely manage to find victims despite their incredible supernatural powers. The group consists of Petyr (Ben Fransham), an 8,000-year-old nosferatu; Vladislav (Jermaine Clement), a pre-Renaissance Eastern European noble; Viago (Taika Waititi), a 17th century fop; and Deacon (Jonny Brugh), a mid-18th century peasant. The world has passed them by. They are no longer able to keep up with the rapidly changing world in any aspect. They are behind in terms of technology, terminology, fashion, and just about everything else. This is where the film really succeeds in my opinion. It’s not about humanizing the vampires, but it is about making them completely fallible. They don’t really understand how much they don’t know and how far they have fallen behind the times. They manage to survive in some respect because of Deacon’s familiar Jackie (Jackie Van Beek), who lures people tangential to her own life into the clutches of Deacon and his friends. When an ex of hers named Nick (Cori Gonzalez-Macuer) gets not eaten but turned into a vampire, things become much more complicated at the house. What We Do in the Shadows is in many respects a This is Spinal Tap for vampires. A lot of the same basic ideas work here as well as they worked in taking the piss out of heavy metal music. Ultimately, what sells the entire picture and the premise is that our lead characters, the various vampires in all of their guises, are far less impressive than they think they are. They do have some interesting powers and they make liberal use of them, but as the film shows us, most of the time those powers are used for very mundane reasons. 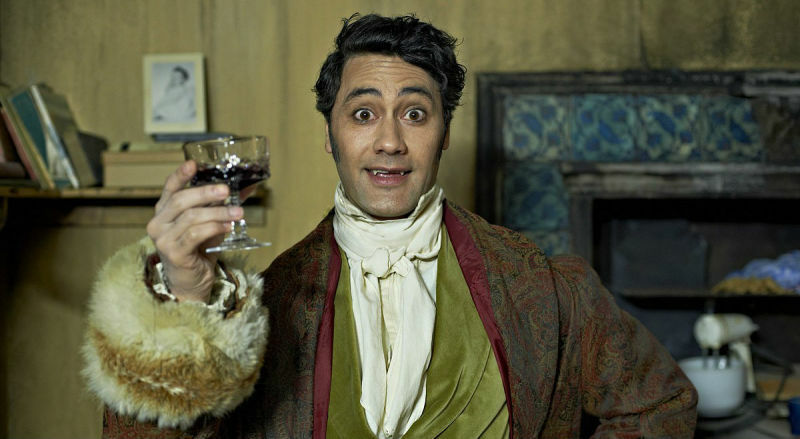 What We Do in the Shadows works because it walks a very fine balance. The film doesn’t take itself or its characters seriously at all, but the characters take themselves very seriously. This is part of what makes them so ridiculous and what makes that ridiculousness really work. It’s easy to laugh at someone doing something stupid. It’s a lot more satisfying to laugh at the same situation when the person involved is not comic serious, but actually intent and serious. Clement and Waititi have managed to give us characters who, despite having lost their humanity, become more human because of their frailties and failures. Beyond that, this is filled with good writing and smart world building. We run into a pack of werewolves at one point, who are much like the vampires in an important sense. That sense is that they’re a lot less impressive in person than they are in our imagination or in legend. Again, the movie allows the werewolves to take themselves seriously without doing the same. And yet in all cases, our vampires and werewolves and other supernatural creatures actually do have power and can do some impressive things. What We Do in the Shadows works. I could stand it being a little longer, but I don’t know that I really want it to potentially spoil just how well it works. There are rumors that Clement and Waititi are working on a pseudo-sequel about the werewolf community (tentatively titled We’re Wolves). I can only hope that’s the case. Why to watch What We Do in the Shadows: It’s genuinely funny. Why not to watch: It’s not quite long enough. I love this movie for all the reasons you gave. It was such a blast to watch. Hadn't heard there might be a sequel. If there is, I am there for it. That's my hope, too. It's good enough that there should really be a sequel to it in some way.